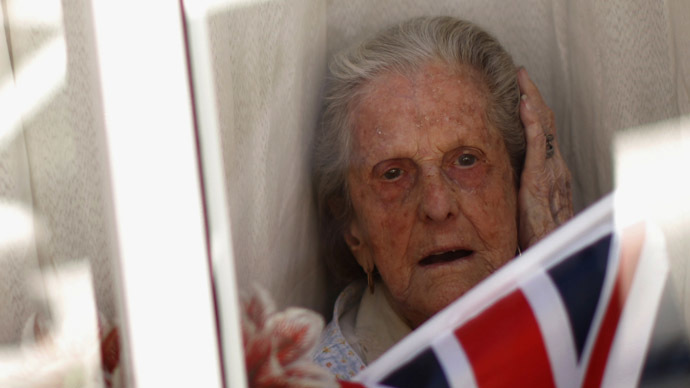 Hundreds of thousands of vulnerable British pensioners receive home state care that is so cursory and inadequate they are forced to choose between eating and being assisted to the bathroom, a Freedom of Information (FoI) request reveals. An overwhelming 75 percent of local authorities in England offer pensioners visits that last a mere 15 minutes, the FoI request indicates. The number of councils booking care workers for these “flying care” visits has shot up 5 percent in the past year. Councils warn crippling funding cuts are to blame for the situation, and have jeopardized their capacity to maintain basic services. They say they need an extra £400 million if they are to provide adequate services to those who rely on them. In a climate of rampant privatization, UK public services are increasingly outsourced. In the case of state care, 90 percent of such services for elderly and disabled Britons are now offered by private companies or charities. Some 110 councils across Britain are currently paying for care workers to conduct these 15-minute visits. Severely criticized, the whistle-stop visits generally occur daily or every two days. Critics warn the rushed timespan is simply too short to allow pensioners and the disabled the time needed for adequate care. Frustrated care workers say they don’t have sufficient time to dress, feed and wash their clients and make sure they have taken any medication they depend on. “Fifteen minutes is simply not long enough to deliver quality personal care, and these visits can leave disabled and older people facing impossible choices like whether to go to the toilet or to have a cup of tea, because they simply don’t have time for both,” he warned. Britain’s health secretary claims he is currently developing a slew of new regulations to dictate how councils purchase care services. He hopes the policy shift will go a long way to ending undignified and rushed forms of state care. Ministers had previously tried to stop the practice by amending the Care Act, so that councils would be obliged to consider the well-being of pensioners when arranging care facilities. But their efforts were unsuccessful. Britain’s councils have been heavily hit with relentless government cuts to public spending in recent years, propelled by the government’s attempt to reduce the nation’s deficit. The UK is suffering from spiraling inequality, plummeting standards of living, and millions of workers have slid deeper into poverty as zero-hours contracts proliferate. And despite relentless austerity measures, the deficit continues to grow. Statistics released by UK government spending watchdog, the National Audit Office, indicate funding to councils has plummeted by 28 percent since 2010. Local authorities’ funding will take a further hit in 2015-16, increasing the overall reduction of council funding to 37 percent. Last week, it emerged that glaring failures by councils to protect vulnerable children and teenagers have reduced them to sleeping rough on British streets, on night buses, in police stations and in drug dens. Many are thought to be at high risk of abuse. A spokesman for London Councils told the BBC that local authorities are doing their best to cope with the crisis amid crippling cuts and dwindling resources in a climate of ongoing austerity.